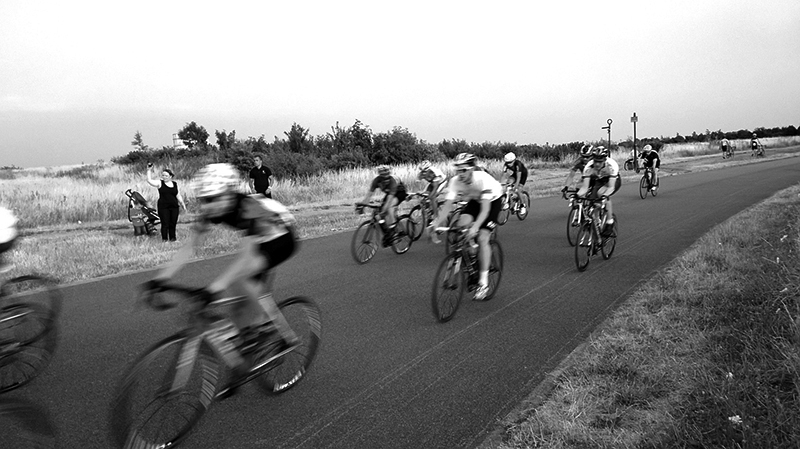 Tuesday nights are racing nights at Hillingdon and the Baroudeurs are coming to the party. I can only imagine that it must be a pretty strange spectacle – a race track in suburban London. For many would-be racers coming in from town, or further afield, it can mean: navigating through the busy streets of Ealing, past the urban landscape, the local hospital, and onto a sprawling Asian High Street in Hayes. Making for a remarkable entrance to a race circuit. Then again, it must be quiet conspicuous for locals to see a rat race donning lycra, rolling through their neighbourhood! We arrive. Glen is sharing his excitement – he’s expressing this with a humungous grin. It already looks like he’s going to have a lot of fun. Alex is an oasis of calm as he grins in the sunshine. Whilst DC is standing tall like a giant, eager to get in the top 10. The race is rapid. Both Elites and Cats are hungry and the finish line is tonight’s prey. The B-Boys join the pack from the rear, as they quickly size up the competition. Well, I hope that’s the plan. By the fifth, all three are manoeuvring for position. There’s a lead by Alex, followed by a lead by Glen, then DC makes a break for it. It’s thrilling to watch the boys lead out the pack. The laps offer technical challenges with twists and blind spots, as well as speedy sprints along two lengthy sections. The finish line can be seen from the distance of the changing rooms, but as the boys come in for the final lap, everyone accelerates. The bell rings. It’s only moments before we see them swing round for the quick climb before they disappear behind the grassy knoll. It’s fast. Seconds later there’s a rush as riders come out of the saddle. There’s a break and and the bunch can’t gobble them up. And the three prize fighters make it to the chequered flag. Knuckles shine white from the grip on the hoods. Teeth grit clear as the riders roll in. It’s another satisfying night a the races. Alex – Ripping up the competition! 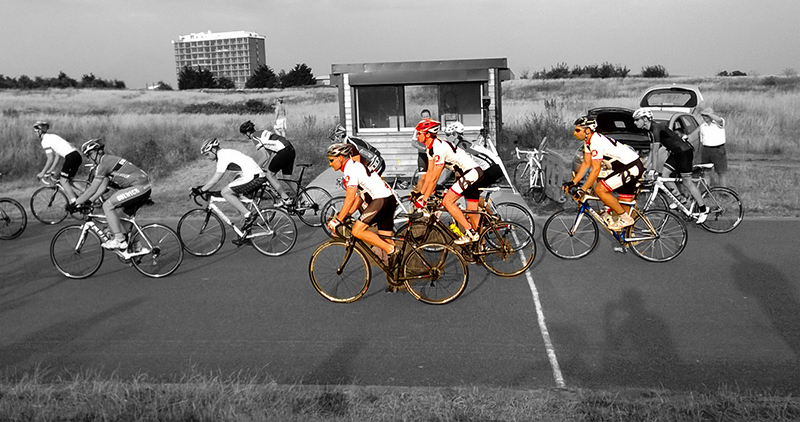 DC – Looking supa-cool up front too! Glen – Forget the mean-machine, this IS Chronos time! Alas, a win is yet to come.